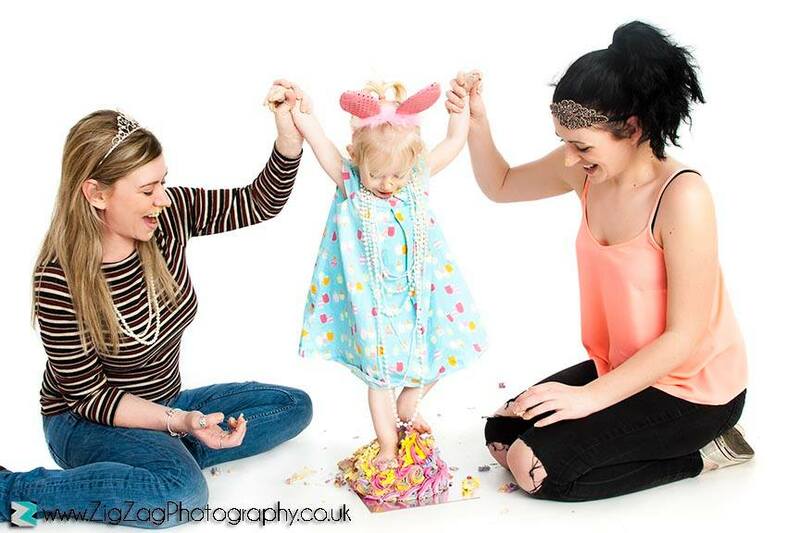 Do you have a birthday coming up that you would like to celebrate with a cake smash photoshoot? 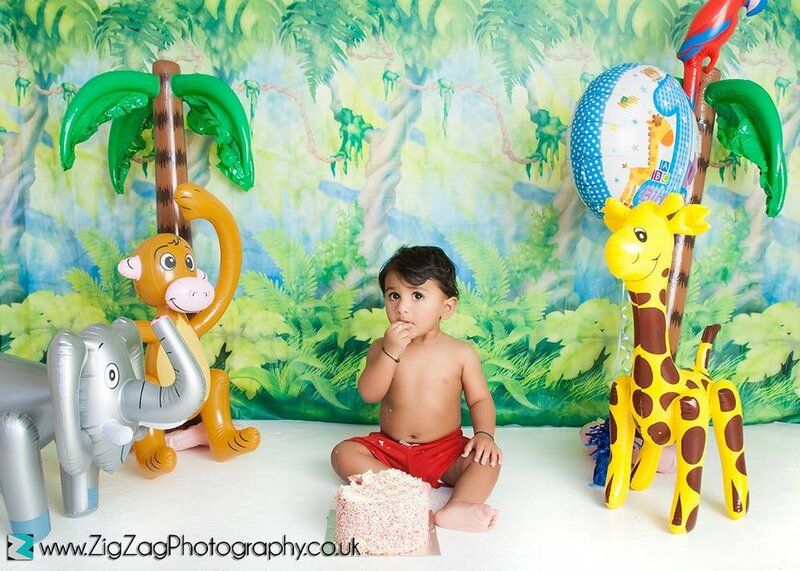 Bring them for a photo shoot at ZigZag Photography Leicester. Mess is no problem! And it's not just limited to one year olds either. Cake Smash Photography sessions are a great way to celebrate your little one's birthday and to also show how much they have changed since they were born! 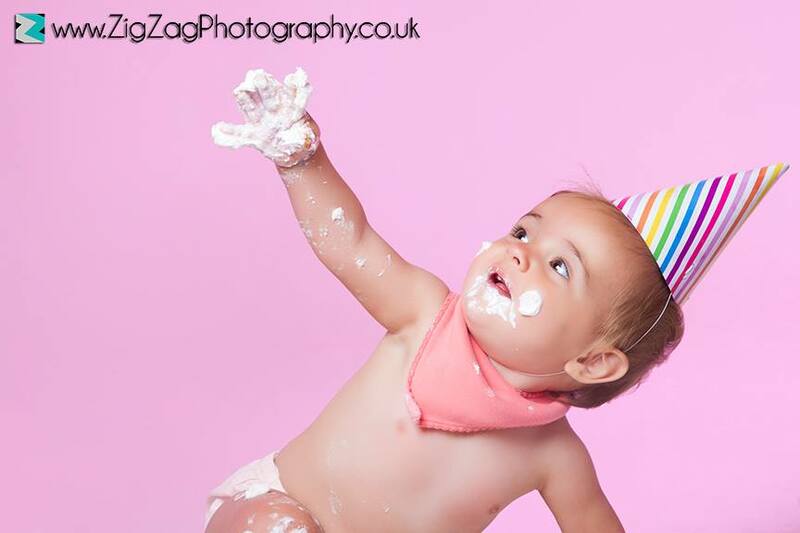 For a lot of children, our cake smash photo shoots are their very first taste of cake and ZigZag photography are here to capture the moment! We do ask that you bring your own cake and this can be as elaborate or as simple as you like. A lot of people like to bring in balloons and banners but you are not limited to how creative you would like to be! We've had tea parties and tipis, anything goes! Have a look through our cake smash gallery to get some inspiration. We have a changing room so you are more than welcome to bring a change of clothes so that you have a couple of options but we do definitely recommend you bring a change to leave in, as it gets very messy in the studio! You have lots of time in the studio though and we can take some images before the cake comes out first! Other members of the family are welcome to join in too. Ideally we will book you in for a week day slot so you can have an hour and a half appointment so we have plenty of time to play with. We can book weekends, but we will be more restricted with availability as we need to ensure we have enough time to clean up before the next session arrives. You can purchase one of our ZigZag vouchers either over the phone on 0116 2700995 or online below. Your limited edition voucher will be presented in this stylish gift box and will cover your session, all editing process, a one hour viewing appointment and a framed 7"x5" image! You will have the option to purchase any further images if you wish.